This past week had the potential for lots of quilting. I was off from work Monday and Tuesday and DH went to convention Thursday and will be home until later today. Then Tuesday I popped down to Heritage Fine Fabrics and picked up fabric for the border to the black and white Strip Twist and backing and binding for my Poinsetta quilt. I’ve got to quilt in the holly leaves on two of the borders, then add the stem all the way around. Then I’m going to add some sort of red “berry” between the leaves and in the corners. I like your blk/white strip twist. Looks great! I love the ‘scrap user system’. Some days I want to cut – others I just feel like sewing, so having pieces all ready to go, is a great thing. 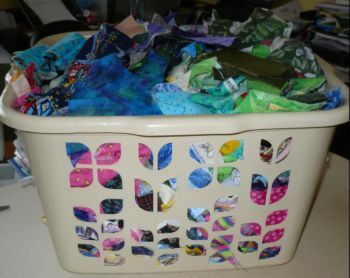 I will aslo make myself ‘kits’ of quilts that I want to make. And the fabrics in some of the kits are ones that I don’t have anymore. A variety of fabrics in a project just, to me, give them life. Have a great first week of March. I really like your black and white strip twist. I seem to be obsessed with black and white recently and just got the fabric to make a blooming nine patch in black and white.